Money's been tight ever since Brianna Winston-Beaufort inherited Savannah's haunted law firm Beaufort & Company, along with its less-than-angelic staff. But she's finally going to tackle a case that'll pay the bills--because this one involves the living, rather than the lost souls she usually represents. The spoiled teenage daughter of a recently deceased pharmacy tycoon robbed a Girl Scout and now desperately needs representation. 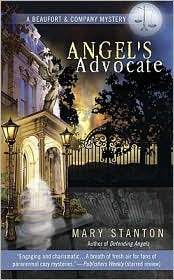 I already look forward to the next book in this series, AVENGING ANGELS, due out next month (YAY). Bree is a good strong character who finds herself in the position to work with angels and assist those who need some intermediaries to get them out of areas of Hell and possibly into Heaven or at least in a better circle of Hell. She has some great assistants aiding in her good fight, a dog, a couple of legal aids, a cool landlady...all of whom are angels of dubious goodness. The office is set in a graveyard that no one but Bree and her aids can find. Also the ghostly clients can't pay the bills and Bree is feeling the pinch. Luckily, she has the free rent of the office, free rent of her abode she shares with her sister, so she's got that going for her. She also has the loving (wealthy) arms of her family should she ever take them up on their offers of funds. I want to smack the crap out of the rich teen, Lindsey, who hires Bree to get her out of the horrid crime she admits to committing. It seemed like a fun idea at the time, in her basic spoiled brat thought process. Her ghost of a father is not much better. That's how I tell the characters are well-written, I want to reach in to smack the crap out the brat characters and hug or high-five the good ones. Thanks for the great review! Did you know, I am giving away Chapter One of Avenging Angels on my site? Have a sneak preview before the the book comes out Feb. 2! Thank you for visiting my blog! I cannot wait until next month and get the next book in the series. I'll be by in a minute.